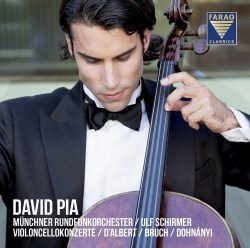 Although his playing features on two CDs in collaboration with other instrumentalists, this is the first time David Pia has taken centre-stage in his own first solo album. He’s avoided the highways of well-trodden territory, preferring the byways less travelled. He was born in Zug, Switzerland in 1982 into a musical family, his grandfather was Karl Richter, conductor and organist. He took up the cello at the age of five, and was taught by Antonio Meneses and Clemens Hagen, attending master-classes by David Geringas, Bernard Greenhouse and János Starker. In 2007 he was a prizewinner at the International Tchaikovsky Competition in Moscow. He’s now a professor at Bern University, assistant to Meneses. When this new release first came to my attention, it immediately sparked my curiosity. It was the Glasgow born Eugen d’Albert’s Cello Concerto that initially stirred my interest. I first got to know it several years ago in a live recording with Emmanuel Feuermann and the National Orchestral Organization under Léon Barzin from Carnegie Hall, New York, dated 22 April 1940. Later, wanting a modern version, I turned to the recording by Antonio Meneses on Pan Classics PC 10336. Pia’s interest in the work no doubt stems from Meneses. It was composed in 1899 for Hugo Becker, a leading German cellist, whose pupils included Enrico Mainardi and Gregor Piatigorsky, and clearly shows the influence of Brahms. Another recording of the concerto appears on Hyperion from Alban Gerhardt. The Concerto’s opening is particularly arresting – a beguiling theme on the oboe, which then passes to the clarinet, supported by the solo cello’s accompanying arpeggios. Eventually, the cello takes up the theme. Pia’s expressive phrasing and beauty of tone, richly hued with myriad tints, are a positive asset, and he negotiates the rhapsodic narrative with an instinctive sense of line. The woodwinds feature prominently, and Schirmer sensitively sculpts them. There’s one point at 7:16 which is a rapturous dialogue between cello and oboe, with both instruments breathing together, matching phrase for phrase. The slow movement follows without a break. Throughout, the cellist luxuriates in its tender lyricism. Then there’s a light-hearted finale that’s certainly not short of romantic moments. The work ends with soloist and orchestra firing on all cylinders. The Concerto deserves to be better known, and Pia’s persuasive advocacy of this alluring work will, I hope, help. I just love it. Dohnányi’s Konzertstück Op. 12 is another work deserving of more attention. János Starker championed it and recorded it a couple of times, but recordings of this captivating score are thin on the ground. I’m pleased it has been included here. Although an extended one-movement work it is tracked as a three movement fast-slow-fast concerto, helpful in some respects. Once again the shadow of Brahms lurks in the shadows, but hints of Richard Strauss are telling on its late-Romantic complexion. The lyrical middle movement is especially soulful, and Pia contours the melodic line with exquisite refinement, with Ulf Schirmer offering thoughtfully nuanced support. The final section has some highly charged moments with the music dying away in peace and tranquillity at the end. Separating the two larger canvases are works for cello and orchestra by Max Bruch. The first is the well-known Kol Nidrei, a work I’m very fond of. This cellist’s endeavours certainly don’t disappoint. He captures the introspective and haunting quality of the music. With his fervent, burnished tone he takes us on a journey of pathos and nostalgia. It’s a performance of dignity and conviction, revealing the sumptuous cello writing and lush orchestration. The Canzone, Op. 55 is proof of how natural a melodist Bruch was. I’ve always enjoyed Antonio Janigro in this work, and Pia’s incandescent playing is every bit as seductive. David Pia plays a Stradivari cello De Kermadec Bläss 1698, on loan from the Foundation Habisreutinger. It has a full, rich, glowing tone. The acoustic of Studio 1, Bayerischer Rundfunk, Munich confers an aura of intimacy and warmth. This is one of those rare instances where I enjoyed every note from beginning to end, and I shall be returning to this disc many times in the future. This stunning debut CD wins hands down.